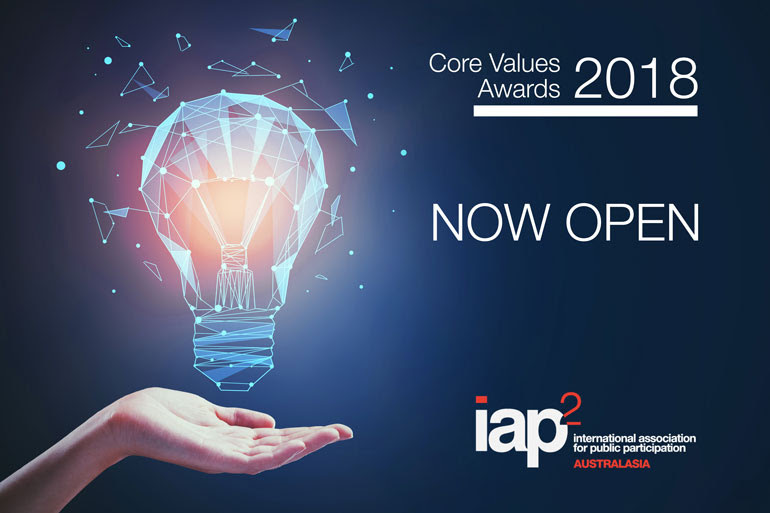 IAP2 Australasia Opens Applications for the 2018 Core Values Awards! It's with great excitement that IAP2 Australasia kicks off 2018 with the launch of its flagship awards program. The IAP2 Core Values Awards recognise outstanding projects and organisations that are at the forefront of public participation and community engagement. They were created to encourage excellence and innovation in this field. 2017 saw some outstanding projects at the forefront of community engagement in Australasia. Will 2018 be your year in the spotlight? Applications for the 2018 Core Values Awards are now open. Applications will be open until 18 April 2018. For more information on the 2018 Core Values Awards please contact Josie Gruber, IAP2 Australasia Marketing Manager on josie@iap2.org.au.